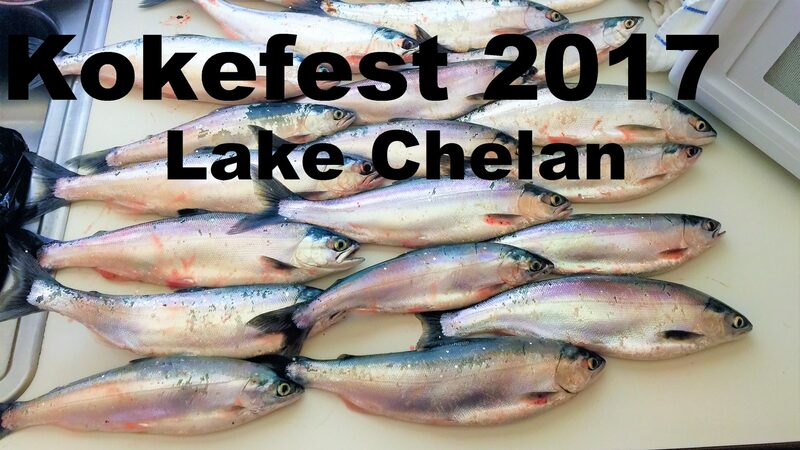 Last year my friends and I started a new tradition of heading over the mountain and fishing Lake Chelan in the spring. We purposefully time it to avoid the derby and other events, as given the choice we’d rather have less congestion on the water and at the boat launch. Below I go into all the details, but if you just want the highlights check out the video. A key element to these trips being a success is doing the prep work ahead of time. Since I was bringing my boat this included not only getting my fishing gear together, but having the boat in working order. For years, I’ve ran 4 downriggers off my boat – 2 electrics in front and 2 manuals out the back. This year I finally bit the bullet and upgraded the 2 manuals to electrics. So part of the preparation was getting the downriggers mounted and wired up. I’m not going to go into details now, but will probably cover that in a future article. Since I was doing some wiring anyway I took the opportunity to install some more lights and power supplies. Add in topping of the oil, greasing bearings, and other regular maintenance tasks I normally perform in the spring and I spent several evenings getting the boat ready to go. 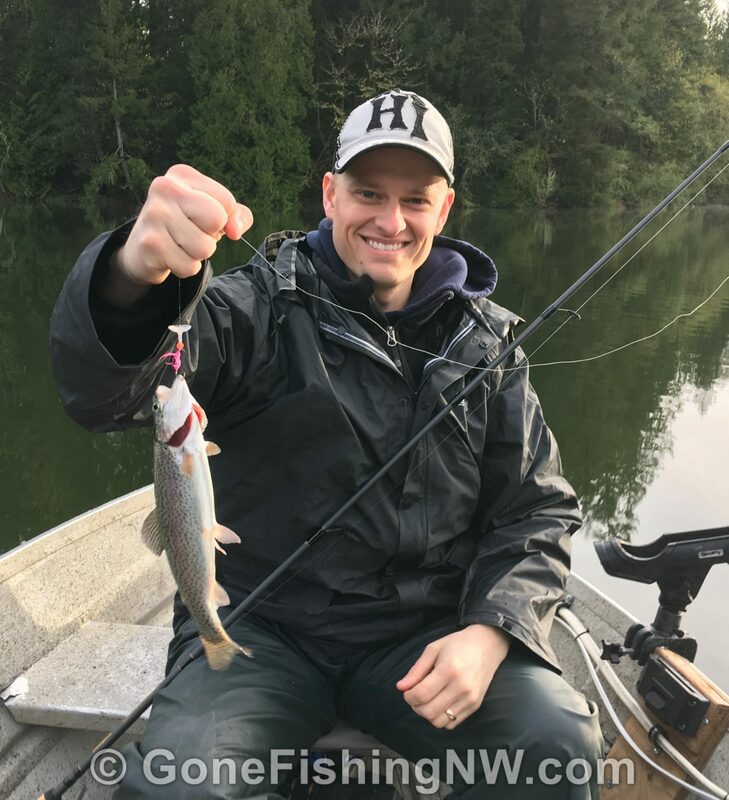 Of course, we can’t forget doing the research about the lake and the fishing to make sure we were armed with the right lures, and had good places to start with. 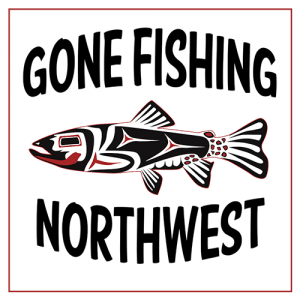 The Facebook group Northwest Kokanee Addicts was very helpful with the reports everyone was posting. 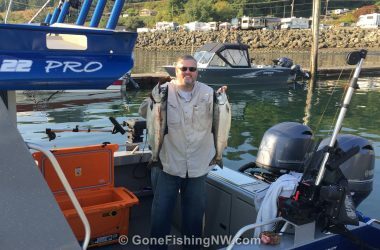 One of the local guides, Sam Baird of Slamming Salmon Guide Service, fishes Chelan a lot and provided lots of information. 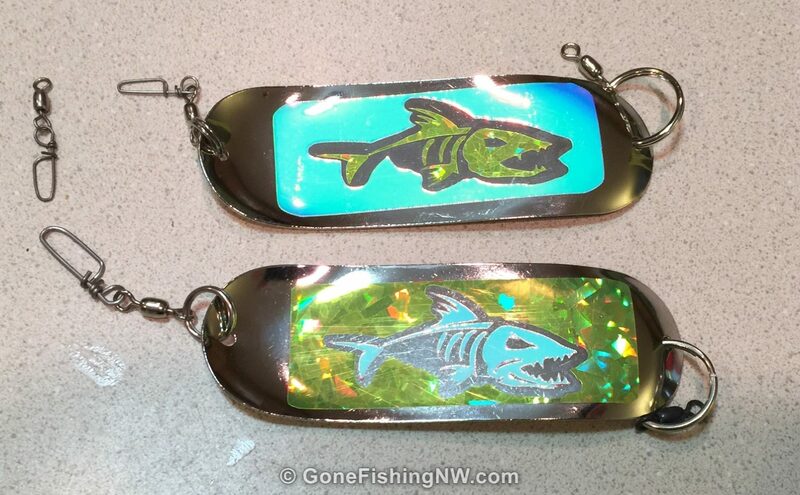 Before the derby he did a run down of the top lures he was using, created a map of commonly referred landmarks and shared his favorite kokanee corn recipe. Below is the map and recipe, shared with his permission. Open the can of corn and drain out the liquid. Place corn into a container. Add in the Fire Cure, Fire Dye and Garlic Salt. Stir mixture. Open tuna can and drain oil into a container. You can add this oil directly to the corn, or if you prefer to let it sit to separate out the vegetable oil from the tuna oil. The tuna oil is heavier and will sink to the bottom. If you have a fat separator that makes it easy. Shake the container every day or so, especially the first few days, to keep it well mixed. If kept refrigerated the corn should last several weeks. 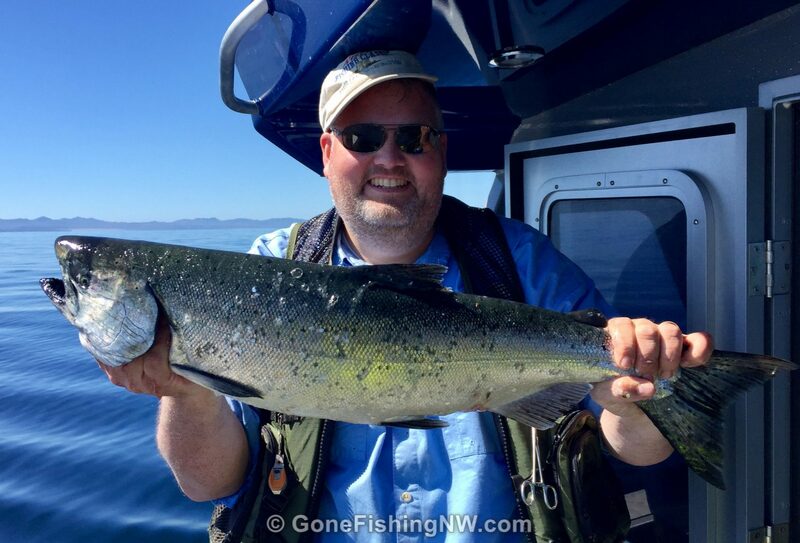 Here is the long awaiting fishing report. 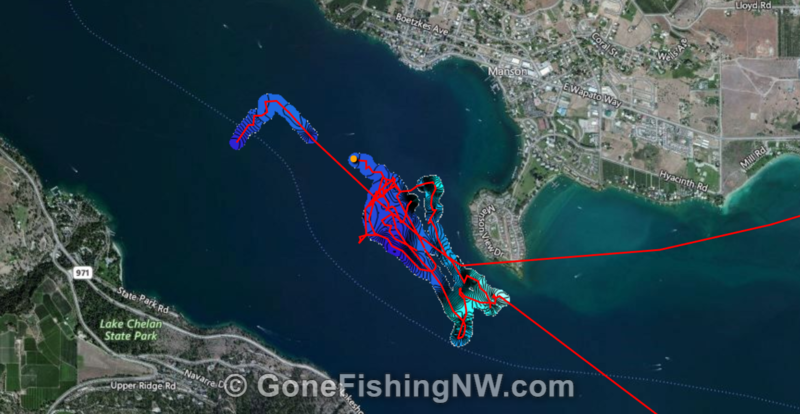 We had 2 other boats in our group, however this is my fishing report so I’m going to scope it to what my boat did. The first day I had one other person in my boat. 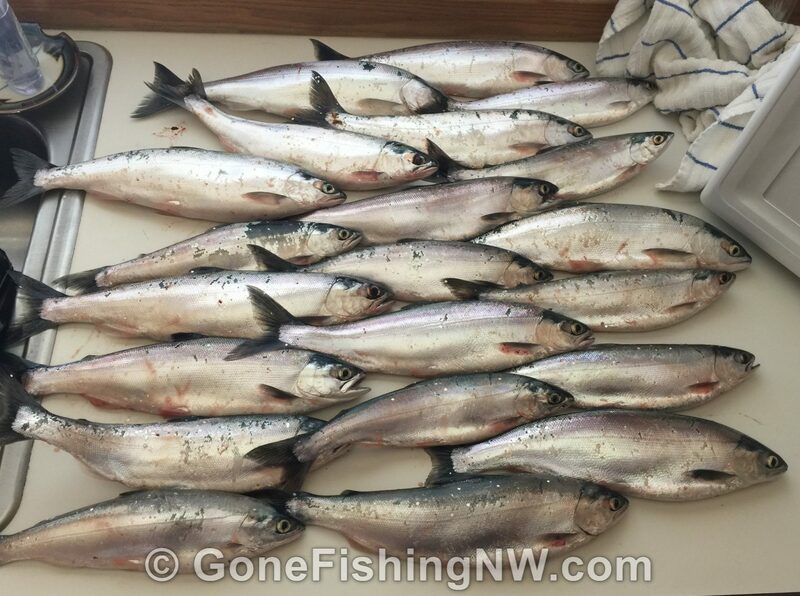 Reports from others indicated Manson Bay was doing well, so that was our plan. We planned for a 6:30am launch. Unfortunately, we weren’t as ready as we thought we were and didn’t reach the Mission Bay launch until about 6:50am. We quickly got the boat launched and truck parked. That is when the trouble began. The jet motor wouldn’t start, as the battery didn’t have enough charge. Fortunately, we could start the kicker without much trouble. Since the fishing area was reasonably close we decided to head out with just the kicker running. Our hope was that the kicker would charge the battery enough during the day that the jet would start up for the journey back. Normally the journey would take about 8 mins, but on the slow kicker it was probably close to 40 mins. This was also the first time I was using the downriggers since converting them to braid. Even though I kept some tension on the line while spooling the downrigger, it was not being tight as it would be bringing up a 10-pound ball. So, I wanted to drop the balls as deep as possible and then let the downrigger bring it back up and repack the line. This is important as loosely packed line will throw off the downrigger counter. 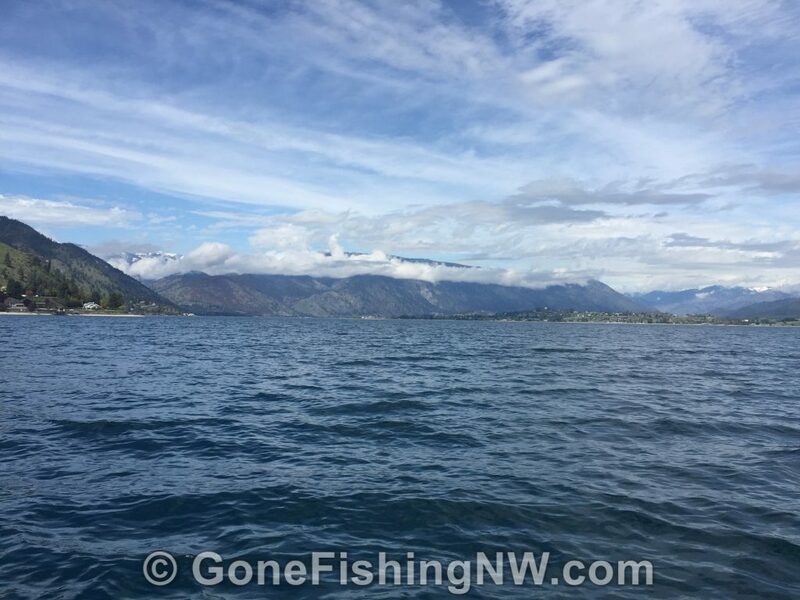 This took more time to do for each downrigger, especially since we were dropping it down to 200 feet – which takes a while to get reeled back in. As we were doing this I was keeping an eye on the voltage for the battery. I noticed that each time the downrigger was operated the voltage would drop about half a volt and then need a couple mins to recover. So, we retrieved each downrigger one at a time to avoid unnecessary load. Finally, we were ready to start fishing about 8am. 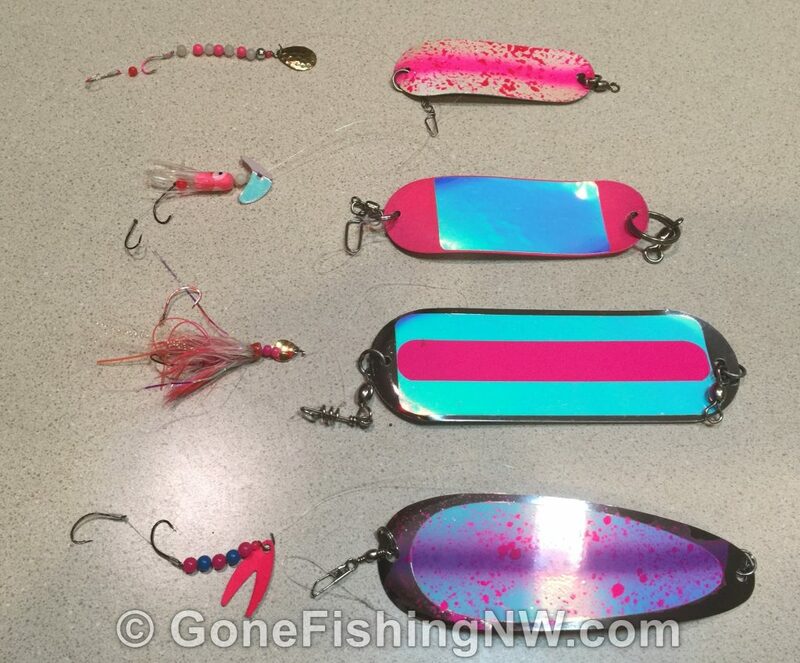 Even though we had good intel we knew we had to start by with a variety of lures and depths to let the fish tell us what they wanted. So we put lines down at 25, 20, 15 and 10 feet deep. 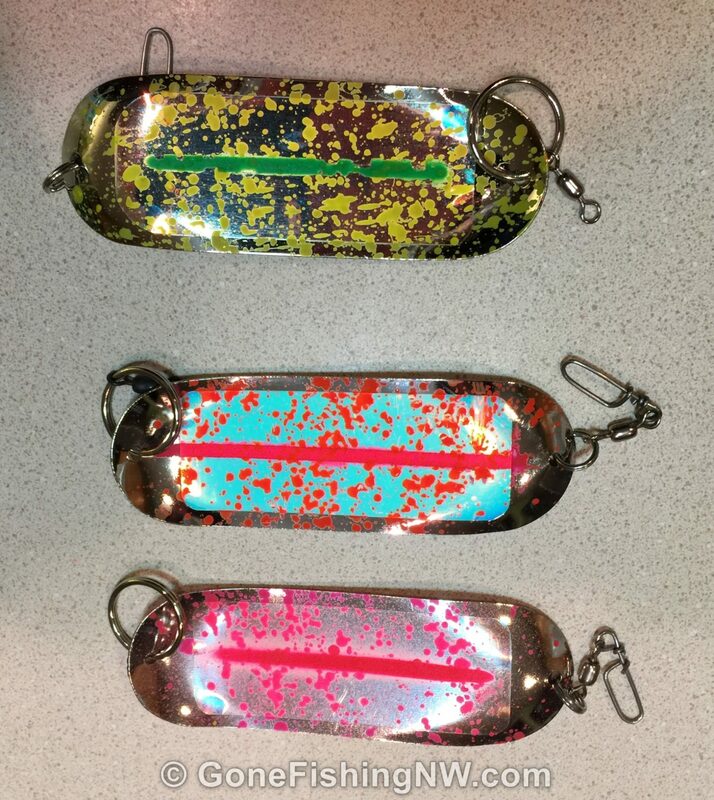 The setup included a variety of dodger colors and lure types – including a couple different hoochies and beaded spinners. We also had both Sam Baird’s corn recipe as well as some of the stuff I normally use. In the first few minutes we had a double on the shallowest lines, both of which were running the orange corn. After landing those fish and getting the lines back out a pattern soon developed. We responded by converting all lures to use the orange corn and fishing the top 15 feet. Action was steady throughout the morning. We had the best results about a quarter of the way from shore. There were two size classes of fish and we caught about a half and half mix. About 9am the fishing slowed down, and it took us a little while to figure out the fish had gone deeper. We adjusted and soon were catching fish again down at 40 feet. It was around this time the fish started showing a strong preference towards the hoochies and Franks Flies, rather than the beaded spinners. So, we switched things up. About noon we limited out with 20 fish, with the last few being caught down at 70 feet. Unfortunately, the jet would still not start, so we had a long boat ride back to the launch. Later that day we went into the town of Chelan and bought a new marine battery at Walmart. After we dropped it in and wired it up the jet turned over without any problem. The second day I also had one other person in the boat with me. This time we targeted 6am and executed well on that plan. With the jet now working, and all the kinks worked out from the day before we had lines in the water by about 6:20am. 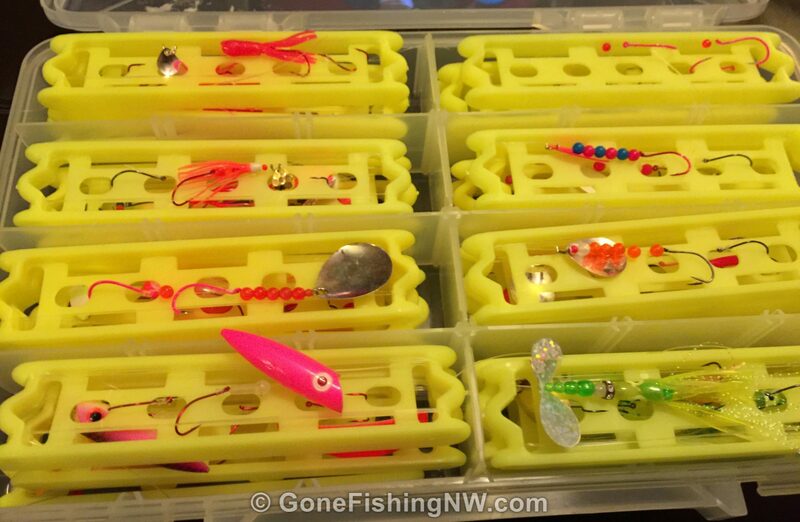 I started with the same setups I finished with the day before – the Macks Hoochie and a Frank’s Fly. Like the day before the orange corn did well and the fish were shallow. We had some great action, but lost a few at the boat. Again, fishing slowed around 9am and we dropped lower immediately. We finished with our 20 fish about 10am, and it was nice to get off the water earlier and go take a nap. The last day there were a total of three people in the boat. We knew we’d have to be on our game and get started early in order to limit out the boat before we had to get on the road back home. Therefore we launched at 5:40am. 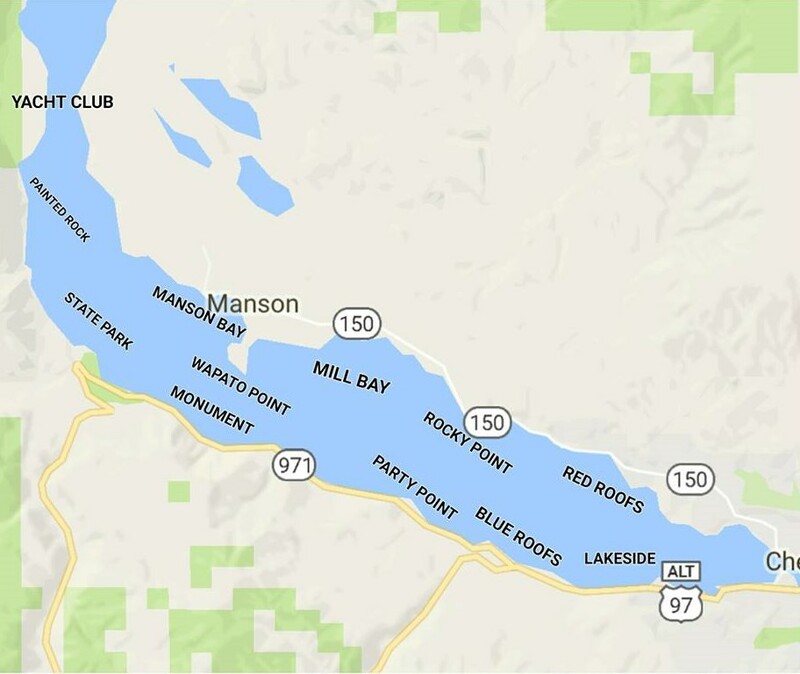 I wanted to try a different spot, but my friends wanted to go back to Manson Bay for the “sure thing”, so that is what we did. One of my friends who was fishing in his boat had told me they had success the day before on a beaded spinner setup we used last year. This inspired me to switch it up a bit from what I had been using the two days before. We got our lines in the water, and it was “Fish On!” all day. Around 7am the bite really took off, and we couldn’t keep all four lines in the water. We lost the occasional fish, but most wound up in the cooler. By 8:30am we had 28 fish in the boat, and just needed 2 more to reach our limit. Around this time, the wind started to pick up, and we had to battle wind and waves to keep the boat trolling well. About 30 minutes later we had our limit and were able to return to the launch around 9am. This day while hoochies performed well it was really beaded spinners that ruled the day. 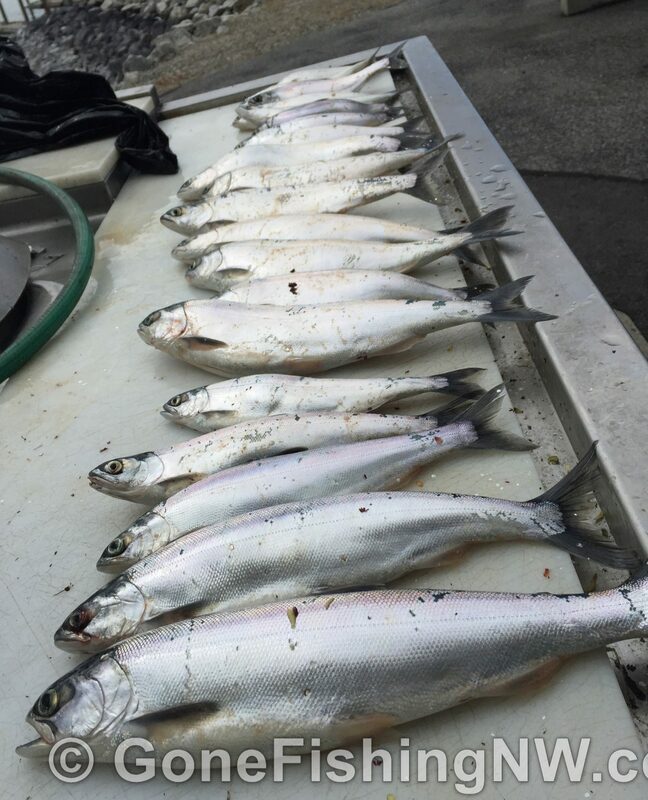 For all three days, my boat ended with the combined limit, for a total of 70 fish. Sam Baird’s corn recipe is a clear winner and I’m looking forward to trying it on my local waters – and maybe even experiment on it a little. Each day we did a better job catching fish than the previous. Part of this was avoiding the issues of the first day. 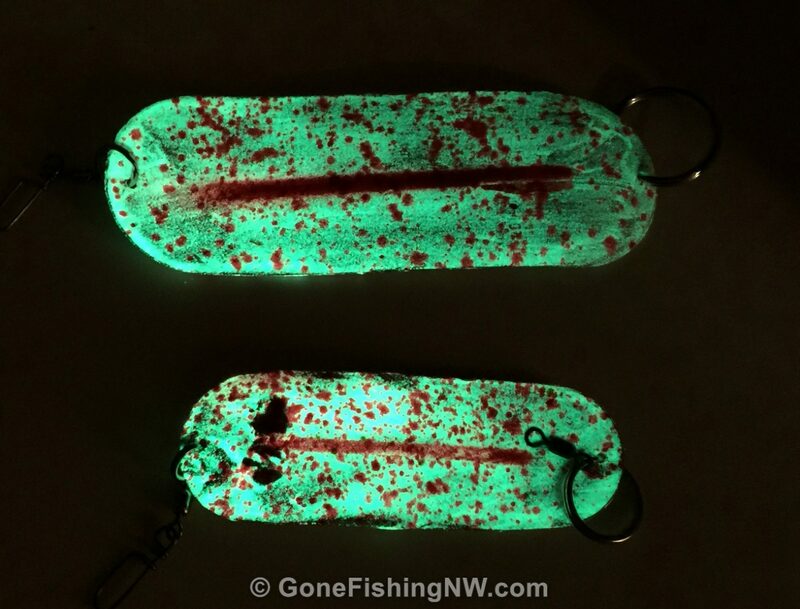 There definitely is an advantage to fishing a location often, or multiple days in a short period of time. Of course when I got home I had to cook up some of that fresh fish. We made B.L.A.S.T. 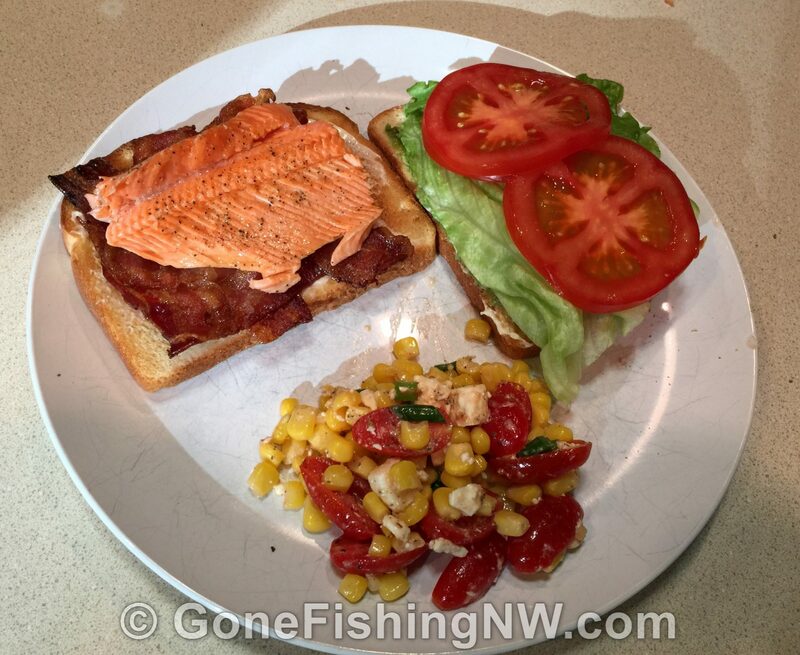 (Bacon, Lettuce, Avocado, Salmon, and Tomato) sandwiches with kokanee fillets for the salmon. We served it with a side of corn salad. It was delicious! It was nice meeting you thank you for letting Patty and I tag along. Love Chelan it was our first time there and we are looking forward to visiting again soon. Happy fishing thanks for all the information leading up to the trip we had a great time.